Do you know WhatsApp bot? No, Then listen Duta is one of the best bots in Whatsapp. Well, Today we will learn how to activate data and how to use data to get Google search result, Dictionary word meaning, Wikipedia search, Live train status, Hindi and English GK quiz, Live Cricket Score, Football score, Train PNR status, Live train status, Motivational quotes, Bollywood & Hollywood news, India etc. Not only this but also Duta will provide you full info of Gita, Quran, Bible, Ramayana, gurugranth, Jain, Balaji etc like devotional content. 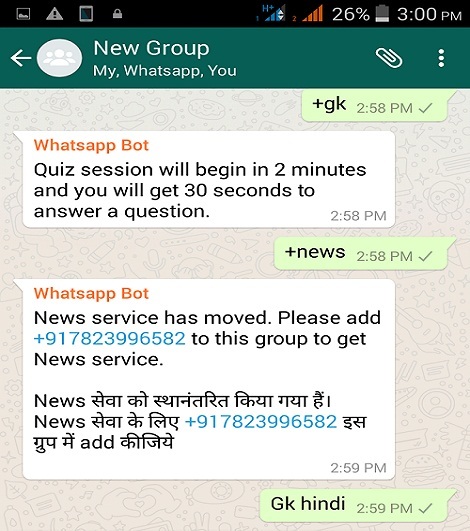 But before using duta You should know that the team who developed this WhatsApp bot is not associated with WhatsApp Official. WhatsApp bot is created by www.duta.in. it allows WhatsApp User to access Google, news, Live Cricket Update and many more features right in your Whatsapp app. Open WhatsApp mobile app and Create a group (You can use Old group also). Add “Duta number” in this Whatsapp group. For faster services from Duta, Please add +917397659976 to this group. Use DUTA to get latest scores, sport and other news, entertainment, games and a lot more! That’s it. Now duta is working in your WhatsApp Group. Add your friends & family Whatsapp member to this group and enjoy duta service. For Wikipedia information, type Wiki SEARCHTERM and send to this Group. To get English news, send +NEWS to the group. Get Football or Cricket Updates by sending +CRICKET or +FOOTBALL to the group. Below duta numbers and codes are taken from duta.in. Use these code to take real benefit of WhatsApp for Sports, News, Entertainment, Celebrities, Quiz/Games, Devotional, Services like Wiki information on WhatsApp. For more codes and information about duta, visit www.duta.in. I hope you are enjoying duta in your Whatsapp Group. If this guide helped you in activating duta then Please share it with your friends. Now let us know How duta helped you..?? Why does not work correctly? Plz develop to work correctly. Recently Whatsapp has updated its Application. So Whatsapp bot is unable to work with this Updated Whatsapp. Please wait untill whatsapp bot update..! New Whatsapp duta number has been added successfully. Add this new number in whatsapp group. Im using whatsapp on iPhone and added Duta number as mentioned in ur arricle and also added +917823996480 as a contact for fast service. The second numbe is not showing up in whatsapp contacts just Duta number +919042002970 is showing up. so i created a new group with 2 members and the Duta number +919042002970. It didnt send me any welcome message and nothing is happening at all. I would love to use the dictionary feature of this. I have saved duta and wiki into my contacts but they are not appearing in my whatsapp list. I have refreshed the list several times but still the same problem. Can you please let me how can I get rid of this issue. I feel happy that you got something useful. Duta sir please help me !